Transporting a sleeping deity to meet his female consort. Every year on March 15, coinciding with the vernal equinox, the Hōnen Festival is held at Tagata Shrine in Komaki. Image from YouTube user 谷古宇正信 . In the Christian tradition, Easter marks the resurrection of Jesus Christ. Some scholars  say the holiday, which falls around the spring equinox, has some pagan or pre-Christian influences . For example, in some Western countries the Easter holiday is represented by colored eggs and rabbits—both symbols of fertility and the promise of rebirth in spring— that were used by ancient Saxons in Northern Europe, while they worshiped the Goddess Oestre (or Eostre). At Tagata Shrine  (田縣神社, Tagata Jinja), in Komaki, just north of Nagoya  in central Japan, the symbolism is stark; there is no beating around the bush, as prayers for fertility and bountiful harvests in the coming year are represented by a large wooden phallus. Originally Takeinade, the male deity, was represented by a straw effigy with a small wooden phallus. 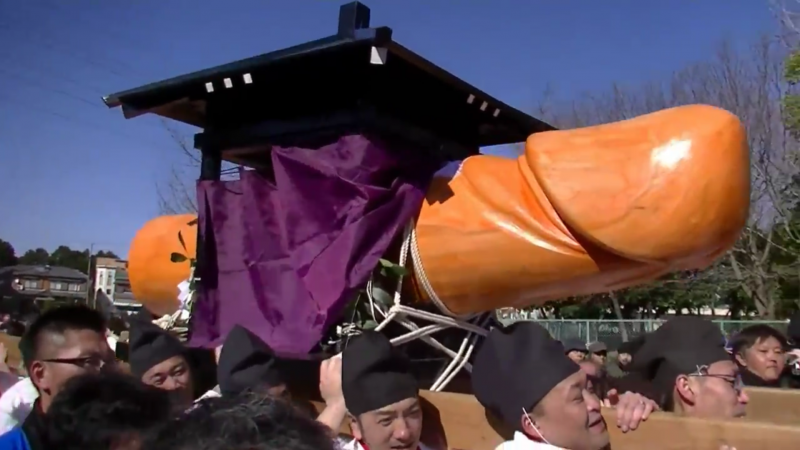 Over time, as the festival evolved Takeneinade and his wooden phallus were obscured inside the mikoshi portable shrine. Tamahime-no-mikoto is returned to her home at Ogata Shrine  just up the road. You can explore the Honen Festival on Instagram and Twitter using the hashtags #tagatashrine , #田県神社  and #豊年祭 .